Summary: ZNF804A, a gene that contributes to schizophrenia also affects brain function and structure during early stages of fetal development, researchers report. A gene associated with the risk of schizophrenia regulates critical components of early brain development, according to a new study led by researchers from Penn State University. The gene is involved in the translation of proteins from RNA and in the proliferation and migration of neurons in the brain. Understanding the function of this gene — described this month in journal Molecular Psychiatry — could lead to more effective treatments for schizophrenia. Schizophrenia is a severe mental disorder that affects approximately 1 percent of the world’s population. Treatments tend to focus on alleviating symptoms, which include delusions and hallucinations, rather than addressing the underlying causes. Like many human diseases, schizophrenia is complex, and no single genetic or environmental factor has been identified as the cause of the disease. 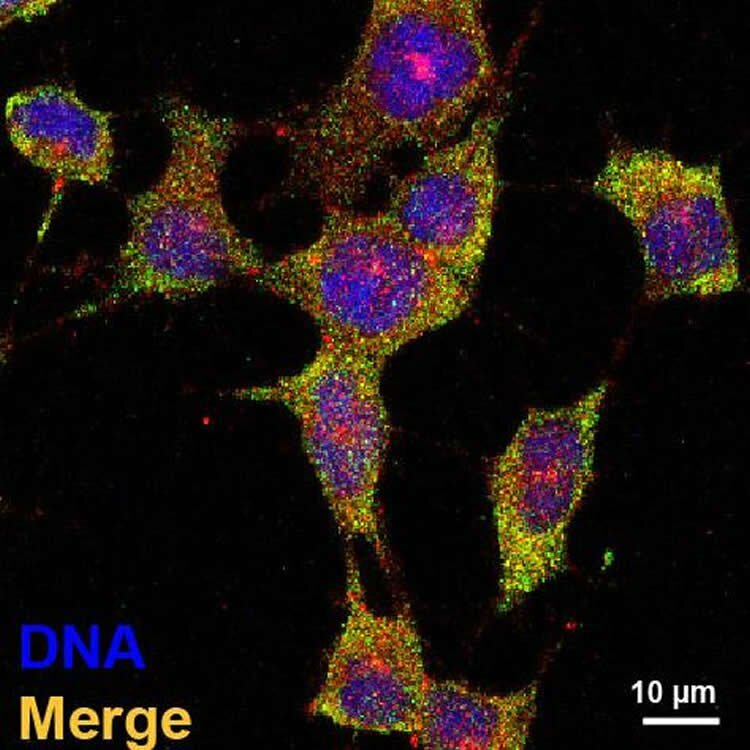 The ZNF804A protein and ribosomal protein RPSA, co-localized in mouse nerve cells, were stained with fluorescent dyes and merged into a single image. Both are involved in the translation of proteins from RNA. A new study demonstrates the role of ZNF804A during proliferation and migration of neurons in the brain as well as its contribution to psychiatric disorders like schizophrenia. NeuroscienceNews.com image is credited to Yingwei Mao lab, Penn State University. The research team identified genes that interact with ZNF804A, which include 9 genes involved in controlling the translation of RNA to proteins. This suggests an influential role of ZNF804A in this important decoding process. Using a mouse model, the team also demonstrated that two processes during neurodevelopment are regulated by the gene: proliferation — the replication of neuronal stem cells that have the potential to become multiple different kinds of cells, including neurons — and migration — the movement of neurons to specific locations in the brain during development. Liu at Penn State; Thomas Lanz, Veronica Reinhart, and Hualin Xi at Pfizer; and Jizhong Zou at the National Institute of Health. Funding: This research was funded by the National Institutes of Health and supported by the Brain & Behavior Research Foundation, the American Heart Association, the National University of Defense Technology, and the Huck Institutes of the Life Sciences. Image Source: NeuroscienceNews.com image is credited to Yingwei Mao lab, Penn State University. Penn State “Gene Associated With Schizophrenia Risk Regulates Early Brain Development.” NeuroscienceNews. NeuroscienceNews, 25 September 2017. Penn State “Gene Associated With Schizophrenia Risk Regulates Early Brain Development.” http://neurosciencenews.com/neurodevelopment-schizophrenia-gene-7578/ (accessed September 25, 2017). Recent genome-wide association studies identified over 100 genetic loci that significantly associate with schizophrenia (SZ). A top candidate gene, ZNF804A, was robustly replicated in different populations. However, its neural functions are largely unknown. Here we show in mouse that ZFP804A, the homolog of ZNF804A, is required for normal progenitor proliferation and neuronal migration. Using a yeast two-hybrid genome-wide screen, we identified novel interacting proteins of ZNF804A. Rather than transcriptional factors, genes involved in mRNA translation are highly represented in our interactome result. ZNF804A co-fractionates with translational machinery and modulates the translational efficiency as well as the mTOR pathway. The ribosomal protein RPSA interacts with ZNF804A and rescues the migration and translational defects caused by ZNF804A knockdown. RNA immunoprecipitation–RNAseq (RIP-Seq) identified transcripts bound to ZFP804A. Consistently, ZFP804A associates with many short transcripts involved in translational and mitochondrial regulation. Moreover, among the transcripts associated with ZFP804A, a SZ risk gene, neurogranin (NRGN), is one of ZFP804A targets. Interestingly, downregulation of ZFP804A decreases NRGN expression and overexpression of NRGN can ameliorate ZFP804A-mediated migration defect. To verify the downstream targets of ZNF804A, a Duolink in situ interaction assay confirmed genes from our RIP-Seq data as the ZNF804A targets. Thus, our work uncovered a novel mechanistic link of a SZ risk gene to neurodevelopment and translational control. The interactome-driven approach here is an effective way for translating genome-wide association findings into novel biological insights of human diseases.